Validation policy for a simple hierarchical trust model. Definition at line 34 of file validation-policy-simple-hierarchy.hpp. Definition at line 29 of file validation-policy-simple-hierarchy.cpp. References ndn::security::v2::getKeyLocatorName(), ndn::Data::getName(), ndn::Name::getPrefix(), ndn::Name::isPrefixOf(), and ndn::Name::toUri(). 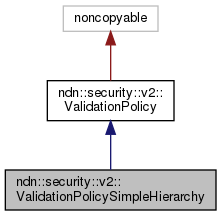 Definition at line 47 of file validation-policy-simple-hierarchy.cpp. References ndn::security::v2::getKeyLocatorName(), ndn::Interest::getName(), ndn::Name::getPrefix(), ndn::Name::isPrefixOf(), and ndn::Name::toUri().